GREETINGS RESEARCHER, and welcome to a new edition of Prostate Insights. We have exciting things to announce and important information about new and current treatments. More treatments are becoming available today for men who have metastatic prostate cancer. William K. Oh, MD and Charlie Baker from the Tisch Cancer Institute will provide an overview of the unique radiotherapy called Xofigo (radium-223). The article answers common questions, explains the results from the trial that led to its approval, describing how it works, covering side effects, implementation into treatment plans, and more. We recently held our second annual 2016 Moyad + Scholz Mid-Year Update, which was a unique educational experience for those who attended. The attendees enthusiastically participated in the discussion. The article that recaps the event summarizes the lectures and many of the questions that were posed. DVDs of the lectures and Q+A sessions are available here and are a valuable educational re-source for anyone interested in the topics. At the conference, Mark Moyad, MD announced the Moyad Challenge, encouraging attendees to step outside their comfort zone and get to a new level of mental and physical health. Dr. Moyad provides an overview of the challenge in this issue. Exciting new studies were presented at the 2016 American Urological Association (AUA) meeting this year, and in his article, Mark Scholz, MD analyzes the studies, breaks them down, and ex-plains their significance to patients. The studies he chose focus on radical prostatectomy and salvage radiation, but also covers an interesting study examining how information found on the internet influences treatment choices. We are pleased to announce a new addition to our Board of Directors. John Anderson is a U.S. Air Force veteran, business executive, and a well-studied prostate cancer survivor. A brief article introduces him and shares some of his personal thoughts about his new involvement with PCRI’s leadership team. Silvia Cooper assists patients and caregivers on our Helpline. This issue’s Helpline Corner shares her personal story of managing the cancer treatment for both of her parents. The article demonstrates the integral role of the caregiver when it comes to researching, weighing the options, and making the right treatment choices. We have the privilege of sharing a useful tool created by our partners at the California Prostate Cancer Coalition (CPCC). This tear out has a list of questions for you and your doctor that can help you initiate conversation with your doctor(s) in a productive and collaborative manner. Be sure to check out their website for more educational resources and information on advocacy. 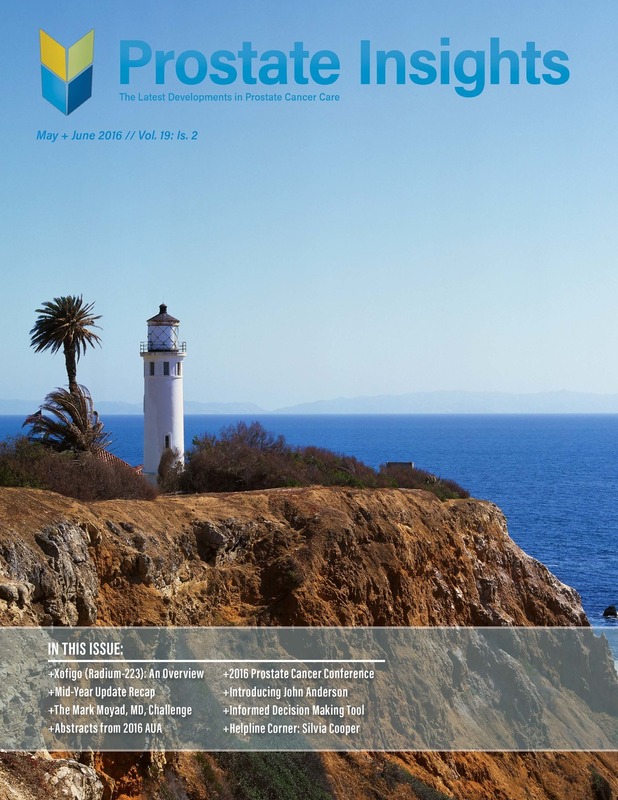 Our 2016 Prostate Cancer Conference is coming up in the next few months, and we have all the information about speakers, topics, and travel logistics in this issue. Be sure to sign up today and reserve your space at this one-of-a-kind educational experience. Battling prostate cancer takes a well-rounded understanding that comes from good education, support, and collaboration with your medical team and caregivers. Our hope is that you enjoy this issue of Prostate Insights, and you learn something useful that you can apply to your case.